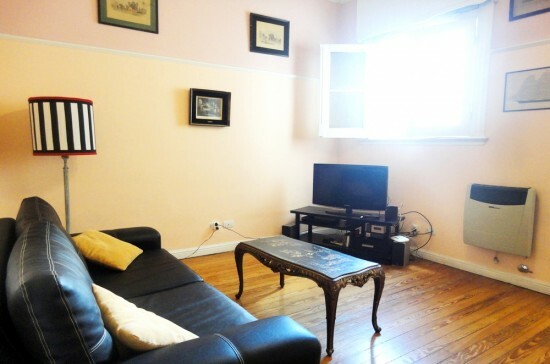 The apartment is located to two blocks from the street Defensa and Parque Lezama. It is accessed by a stairway filled with hanging plants. Is spacious and bright. It has a living room with two windows facing a side yard, so the apartment is very quiet. There is a table with chairs, a large sofa bed and a plasma TV. The apartment has a full kitchen, bathroom with bathtub, a double bedroom with ample closet space. If you want authentic atmosphere rather than an antiseptic hotel, then this is what we offer. Minimum stay: 1 month. Simple and warm style, is an ideal place for a couple looking for relaxation. Minimum stay 15 days. Apartement and Casa San Telmo services are very good. Excelent adress. Como siempre que trate con Casa San Telmo, el trato fué excelente. Muy recomendables. Lindo departament, correctamente equipado, en zona tranquila y cerca de todo. Excelente trato por parte de San Telmo. Servicios absolutamente recomendables. We were two students living in this apartment for three and a half months. One in the bedroom and one on the couch. The bed was excellent, the couch however was not very comfortable, but putting the mattress on the floor worked nicely. Other than that it was a great location in a beautiful neighborhood. Neither far to buss-connections, the metro or bars and restaurants. The appartement is also great, not very big, but more than enough for two people. Also very conveniently located, there is a supermarket right across the street, a barber, a laundry and a bakery right next door. I would recommend this appartement. All over 7/10. Servicio: muy buen trato hacia los huéspedes, personas confiables, amables y serias en el trabajo. El departamento está en muy buen estado, limpio, ordenado, bien ubicado. Agradecemos todos los servicios y las atenciones. Todo era muy lindo, especialmente los muebles antiguos, todo bien arreglado, cocina, congelador cama doble etc, el departamento era lindo y la zona buena (hay el supermercado en frente una lavadora al lado, una pasteleria de otro lado y un café fantastico a una cuadra). Perfecto y muy comodo el wifi y un bellissimo televisor para ver la tele de todo el mundo. Los organizadores eran muy gentiles y atentos al cliente. Como siempre en Argentina, desafortunadamente el bano no era gran cosa por los que tienen costumbres europeos (habia agua caliente pero con esos grifes era imposible mesclar la temperatura, la ducha era muy instable, y no habia calentamiento el el bagno...). Con un bano organizado de manera diferente seria todo perfecto. Great place, just like the pictures. Close to Av. Caseros and a number of great restaurants and bars. All the persons involved were professional and attentive. Everything went well, the apartment was comfortable for my wife and I and we would recommend it. El departamento es muy comodo y se encuentra bien ubicado. Es sumamente recomendable para aquellos que le guste San Telmo. Patricio .